Primary Function: Day/night, twin-engined, attack/reconnaissance helicopter. Apaches fired the first shots of the Desert Storm War -- attacking Iraqi radar sites. Around the world, defense forces fly two variants of the AH-64 Apache multi-mission combat helicopters: the AH-64A Apache and the next-generation version, the AH-64D. Equipped with radar, the aircraft is known as the AH-64D Apache Longbow, without radar it is the AH-64D Apache. The AH-64A Apache was widely recognized as the most advanced combat-proven attack helicopter in the world for the past decade and is the predecessor of today's unmatched AH-64D Apache Longbow multi-mission combat helicopter. Some 900 AH-64As are in service worldwide for the U.S. Army and five international customers. 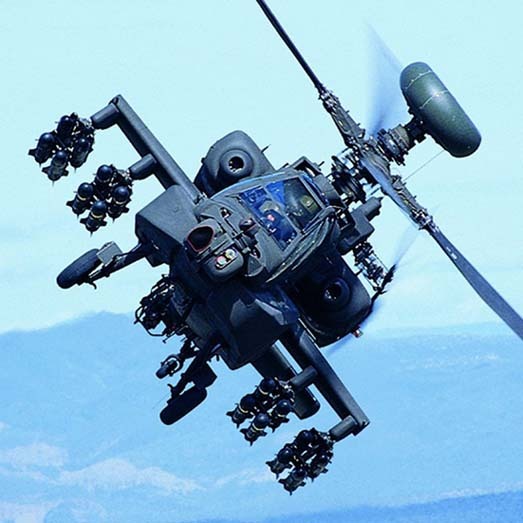 The Apache uses laser, infrared and other high technology systems like the Target Acquisition Designation Sight/Pilot Night Vision Sensor to find, track and attack armored and other targets. The AH-64A were 85% or more combat ready when called upon in the Gulf War. In all, Boeing delivered 937 AH-64A, 821 of which were delivered to the US Army and 116 to international customers, including Egypt, Greece, Israel, Saudi Arabia and the United Arab Emirates between 1984 and 1997.